A CHANCE mutation in a single gene occurred six generations ago to one member of the Old Order Amish community in Indiana USA. This mutation occurred to a gene called SERPINE1 that makes a protein (PAI-1) that extends lifespan. Professor Douglas Vaughan of Northwestern University, Chicago, and his team have now studied this mutated gene in 177 members of the community. Of these 43 carry one copy of the mutation (heterozygous), and seven carry two copies (homozygous). Heterozygous individuals had significantly longer telomeres. Telomeres are caps at the end of each chromosome which shorten every time a cell divides. Short telomeres are a sign that the body’s cells are wearing out and ageing. The average telomere length is highly correlated with chronological age. It becomes nine per cent shorter every decade in most people, however the telomeres of the mutation carriers were on average 10 per cent longer. A husband and wife couple is a common ancestor to all individuals identified in the study as having the mutated gene. 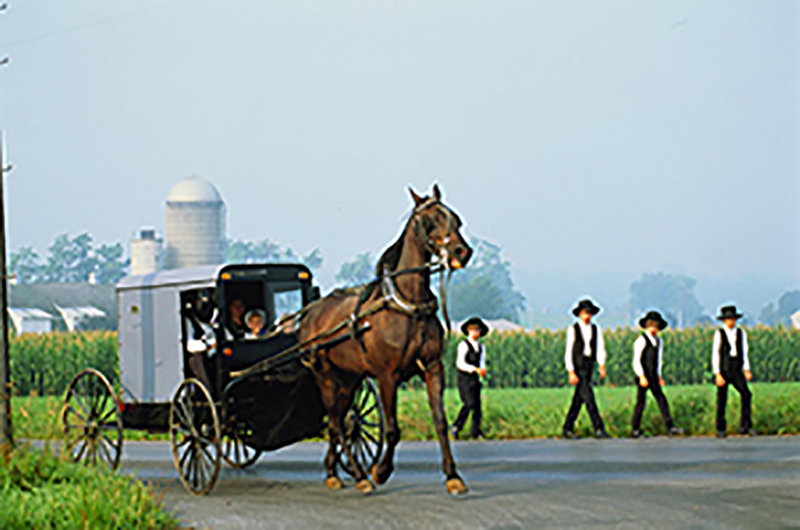 The Amish live in several communities throughout the US and Canada. They stress humility, family and community, separation from the modern world and almost always marry within the community. Ancestral records showed that carriers of the mutant gene lived, on average, ten years longer than non-carriers – 85 years versus 75 years. The researchers excluded individuals who died before the age of 45 to reduce any bias from premature cause of death, including infection, accidents or in childbirth. Mice without the SERPINE1 gene or whose PAI-1 is chemically inhibited are protected from symptoms of ageing including telomere shortening, and live longer. In the Amish community heterozygous carriers of the mutation had 50 per cent lower PAI-1 levels in their blood than non-carriers, while homozygous individuals for the mutation had no detectable PAI-1. Amish, who were not carries of the mutation, had similar rates of hypertension and type 2 diabetes to other members of the US population. However none of those with the mutant gene had type 2 diabetes and they had 28 per cent lower fasting insulin levels. Circulating PAI-1 levels are strongly correlated with fasting insulin levels in the US population. “The carriers appear to be completely protected from diabetes,” Professor Vaughan told New Scientist. Only seven Amish had two copies of the mutant gene and all were under 35, so it is not clear what effect this had on their longevity. PAI-1 is important in cell death. In the ageing process senescent cells accumulate in the tissues and contribute to senility. Drugs that target PAI-1 are already being developed and are currently in early-phase clinical testing in humans in Japan. “There are numerous groups that may benefit from a drug blocking PAI-1,” says Vaughan. People with a single copy of the mutant gene appear to be healthy, therefore drugs that reduce PAI-1 activity may well be safe. The research was published in Science Advances in October 2017.